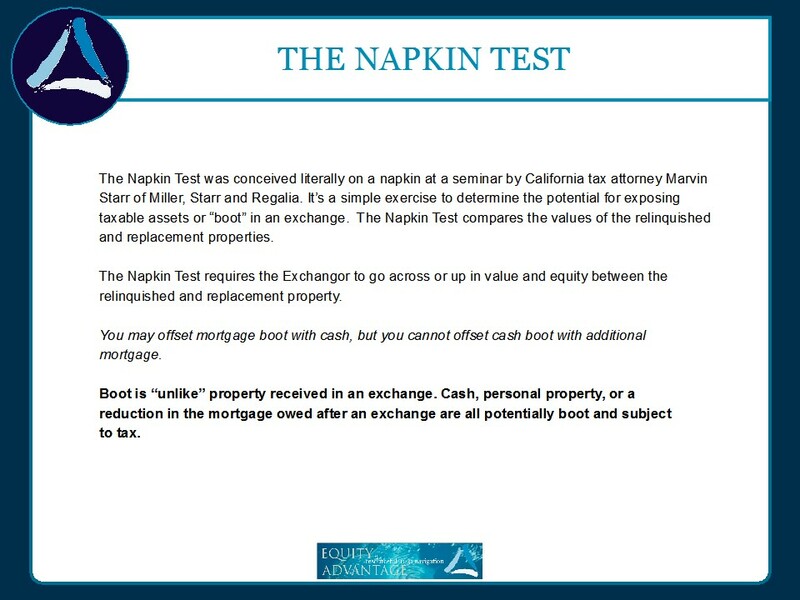 Equity Advantage Incorporated Owner, David Moore covers “The Napkin Test” and 1031 exchange questions at the latest Equity Advantage Advanced 1031 Exchange Seminar. The napkin test. So we’re talking about basis in game. It’s complicated, and you don’t want to have to figure that stuff out. In your mind, if you’re the investor you need to have an idea of what’s going on. Understand what your basis is, and what’s going on. If you’re a broker, you should be asking some questions. When did you buy? Has it been an investment the whole time? Has it been your residence the whole time? When did you pay for it? And understand, you’ve been in this class now so you understand a little bit about basis and gain. If they’re ever gonna tax it, why pay it if you don’t have to, right? Every dollar you save somebody, is that much more they have to reinvest. If you’re a broker, this is the biggest reason you wanna at least let people know it might be an option. Imagine, you didn’t say anything to them and later they found out they could have done an exchange. And you wouldn’t believe the number of transactions, even today that are calls the day after closing. And that’s not a good deal. An example, this was about a dozen years ago now. A broker that’s a good friend, he was working with a person coming out of Texas. Sold a multimillion dollar property down there, and he was going to buy a five million dollar property here. And the broker sends the guy to me for the exchange. He had told the company in Texas that he wanted to, and they closed the deal. So they sent me the guy the day after it closed. The problem is, Scott didn’t get the sale up here. Because the guy no longer had the money to buy it. So number one the client wasn’t happy, that’s the biggest thing. Number two, it still didn’t happen. So… think about it early, work to go forward with stuff. Anyone ever have a listing where a property owner thought the property was worth more than it was? If you find them what they want, are they more or less motivated to get rid of it? A lot more motivated! I don’t care if we’re talking about a house or income property or whatever it is. It is just the way it is. So give people a place to go and everything is going to move a lot more easily. A napkin test is what we use to avoid having to figure out basis in gain. It says you must, for total tax referral go across or up the value in equity between the relinquished and replacement property. Mortgage can go away two ways. One is by going down in value, which triggers tax because you went down in value. The other way mortgage goes away is by adding money to the deal. So when we had the crash, what happened to loan devalue? Decreased. What happened to the equity in a property? It decreased. So people were having to add money to transactions a lot during that period. We might have somebody say, “Gee I don’t want any debt of the replacement, so I’m going to pay off the property I’m selling before it closes so I don’t have to worry about it.” You don’t have to do that. Value and equity is what’s important. It’s not all or nothing, so buy what you want to buy. Know that if you’re ten thousand shy and you’re going to pay tax on the ten thousand, it’s not all or nothing. You’re going to lose… Every dollar you spend. Advanced 1031 Exchanges: What is an Exchange?